One of the largest new housing developments in Crewe prepared for the construction of the storm water wet well, penstock chamber and associated pipework, requiring a trusted supplier for the temporary works. 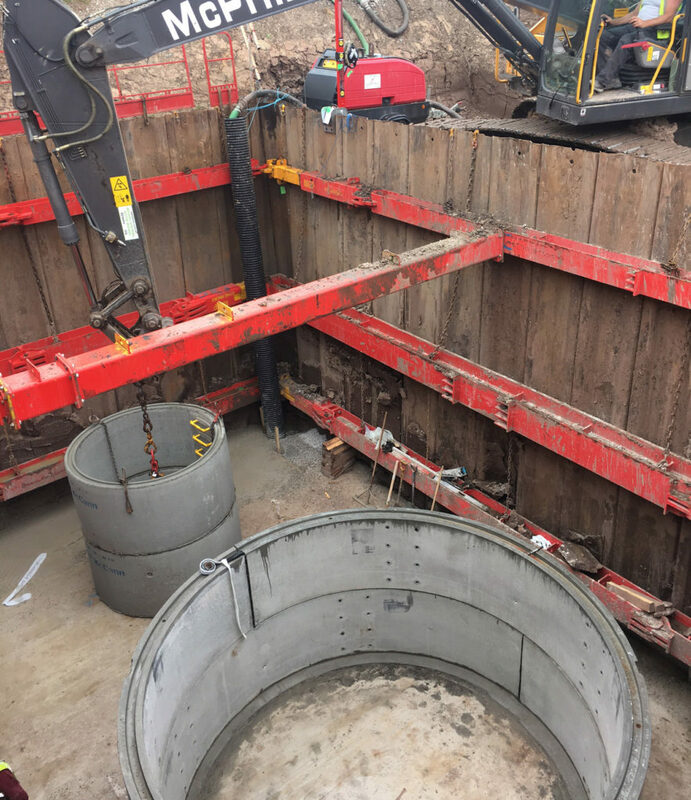 The developers’ site required a 11m x 7.6m excavation to a depth of 9m to provide a safe working environment to facilitate the construction of the permanent works. Despite being up against a competitor, MGF were the preferred supplier for McPhillips and secured the work based on quality service and value of engineering provided in the past. Using ER750/8 trench sheets and 3 levels of modular hydraulic bracing systems including the 245UC, 305UC and the 406UC; the design pushed each piece of equipment close to its safe working load limit to keep the kit specification as light as possible. “From initial discussions to design, delivery and installation, MGF provided excellent service on top of a toolbox talk on the installation of equipment. We have a great relationship”.